(CNN) -- A Thai political leader who helped topple that country's former prime minister was shot early Friday on the way to host his radio talk show, according to a spokesman for his political party. 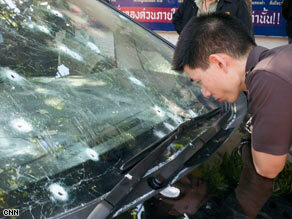 Sondhi Limthongkul's bullet-ridden car is examined. The shooting of Sondhi Limthongkul was the latest chapter in weeks of widespread political unrest in the country, pitting loyalists to Thailand's deposed former prime minister and supporters of the nation's current leader. Sondhi on Friday morning underwent a three-hour operation to remove a bullet from his head. He was conscious and able to communicate, and his injuries were not life-threatening, said Dr. Chaiwan Charoenchokthaveen. He was shot with a machine gun after a truck approached his car at about 5:30 a.m. and someone started firing from inside, said People's Alliance for Democracy spokesman Parnthep Puapongpan. Founded by Sondhi, the People's Alliance headed up street protests that helped spark a military coup of then-Prime Minister Thaksin Shinawatra in 2006. During the past several weeks, violent street protests calling for Abhisit's ouster have racked the streets of Bangkok. Protesters loyal to Thaksin -- called "red shirts" for their preferred uniform -- shut down a planned meeting of Asian political leaders last weekend. Earlier this week, riot police battled with red shirts in an effort to regain control of Bangkok. More than 120 people were wounded in the fray and two people were killed in skirmishes between the red shirts and "yellow shirts" allied with the People's Alliance for Democracy. A day later, authorities issued arrest warrants for 13 red-shirt leaders, including Thaksin, who is already wanted on a number of warrants for other alleged offenses and has been living abroad since the coup. The government also revoked Thaksin's passport on Wednesday. Protests had largely quieted down over the past several days, with leaders of the United Front for Democracy Against Dictatorship calling for calm until the end of the Thai New Year. Observations of the new year ended on Thursday. Before his ouster, Thaksin had been accused of corruption and abuse of power. His supporters are largely rural, living outside of Bangkok, while the yellow shirts are largely middle- and upper-class urbanites who think that Thaksin manipulated supporters they say were poorly informed.